I love this colour. I was afraid it wouldn't show up as bright as I hoped because I have naturally pretty dark hair but the colour turned out rich, vibrant and almost as bright as in the picture. Better than I hoped. Love it. Response from Schwarzkopf LIVE: Fantastic to hear!! Who says you had to have natural hair (boring)! love this colour, I use so many different colours on my hair but this never disappoints to cover it all! Really pleased with the colour, easy to apply & wash off. The problem arises after when my hair is wet it drips onto my clothes. So far ruined 2 t-shirts & 1 dress. If you only wear black would definitely recommend. Really nice colour but I would definitely call the result a rich red, rather than a purple. My hair hasn't come out at all purple. Really really pretty. Was skeptical as usually my hair turns out completely different to the colour on the box. Really pleased with how it turned out! Very vibrant and bright! Love it! Really vibrant colour, matches to what was on the box, stays in hair really well. Would probably look great on you. I just underestemated how pale i am, and how much bright beautiful colours don't suit me, anyone got any advice on how to get back to my usual dirty blonde fast? I've already tried anti dandruff shampoo and vitamin c.
Response from Schwarzkopf LIVE: Hi Hannah, thanks for leaving your review! The anti-dandruff method is usually one of the best ways to help colour fade. You can repeat this method up to 3 times in 24 hours: apply the shampoo to dry hair, wrap it in a towel for 20 mins then rinse thoroughly. Also make sure to finish up with a deep conditioning treatment. If the colour still isn't fading as quickly as you'd like, please contact our Schwarzkopf Advisory team on 0800 328 9214 and an advisor will be happy to help further. Thank you! I was a bit sceptical at first, considering a previous dye job had gone wrong, leaving me with ginger stained hair. The colour has come out so bright and vibrant. Been getting compliments all day. Might add a temporary pink and purple if it starts to fade a little. Response from Schwarzkopf LIVE: Hi Amanda, thanks for getting in touch. To discuss your individual colour needs, please call our Schwarzkopf Advisory team on 0800 328 9214 and an advisor will be happy to help. Thank you. Response from Schwarzkopf LIVE: Thanks for the great review Charlotte! I've always wanted burgundy hair and this was the closest thing to it, I love the colour and get so many compliments! Unfortunately it does fade very quickly so I have to re-apply often. I only wash my hair two to three times a week (not a believer of over-washing) and with colour safe shampoos & conditioners as a habit of always had coloured hair. So the results are great but the longevity of it- not so much :( which is a shame because I love it! Definitely works best on pre-lightened hair but doesn't have to be platinum to get amazing results, I have naturally dark hair so my roots are constantly growing through but this actually works pretty good on dark hair too and gives a good gradient which means less bleaching and happy hair yay! :) Overall, very pleased as always with schwarzkpopf live colours! Response from Schwarzkopf LIVE: Glad to hear this Chloe! :) To keep any vibrant tone refreshed, we recommend you use our Ultra Brights or Pastel colours :) Hope this helps! Love love LOVE IT! I was desperate for a complete change as had dyed black hair for maybe 8 years. I stripped the black out with bleach and was left with extremely bad patchy ginger and different blonde shades of hair. I just went for it and used 2 boxes of Pure Purple hoping for the best. I used 2 as my hair is quite long and I thought it would help with the patches. I freaked out a bit as the dye itself was bright pink but don't let that scare you. I'm sooooo happy with the results and my friends and family all love it. Can't recommend the colour more! Love this colour but i will not be using this colour again! Ive used Live hair colour for the past 10 years and always gone for purple or red, so thought i would give this colour ago but when ever i touch my hair (wet or dry days after putting the dye on) i have purple hands, my clothes are covered in dye when i wear my hair down and also my neck is constantly being dyed, its also ruined my brand new bedding and pillow cases. Not at all happy! Response from Schwarzkopf LIVE: Hi Terri, we're really sorry to hear you've had some colour transfer with this product. So we can help you out with this, please contact our Schwarzkopf Advisory team on 0800 328 9214 and they will be able to offer some advice on why this might have happened and steps you can take to prevent it in the future. Thank you. Fantastic colour, loads of compliments but I'm reapplying every few weeks as colour fades. Response from Schwarzkopf LIVE: Beautiful colour, Samantha! The best thing we can recommend for a prolonged colour is using shampoos and conditioners that are designed to care for coloured hair and not over-washing your hair. If you would like any more help or advice on this please call our Schwarzkopf Advisory Service on Freephone 0800 328 9214 and an advisor will be happy to help! I dyed my hair about 6 weeks ago and the colour's pretty much already washed out, it's unfortunate cause I love the colour but now it's just dark with a hint of colour in the sunlight, disappointed really cause my hair has took some real damage in the process of dying and I fear if I dye again I'll have to cut my hair again also. Response from Schwarzkopf LIVE: Hi Jamie, we're sorry to hear that the colour faded quicker than expected. We'd really like to discuss this further with you and offer some help so you can keep your hair in good condition when dyeing at home. If you'd like to, please give our Schwarzkopf Advisory team a call on 0800 328 9214. Thank you. Response from Schwarzkopf LIVE: So great to hear, Sophie - thanks for the review! Awesome colour very vibrant, lasts well and covers all grey brilliantly. Wouldn't use any other hair dye except XXL this is my favourite colour and on my hair now at 48 years young of makes me feel younger too and the compliments I get are never ending. Thanks. I dyed my hair this colour and I love the colour don't get me wrong but I washed it out and conditioned my hair but the colour for some reason as run and stained my coat and my brand-new top! I was meaning to do a youtube review but not happy about my new top and coat arghhh! Response from Schwarzkopf LIVE: Hi Bliss, we're very sorry to hear that you had some issues with colour running. So we can help you with this, please contact our Schwarzkopf Advisory team on 0800 328 9214 and an Advisor will be happy to discuss this further. Thank you. Response from Schwarzkopf LIVE: Hi Cara, sorry to hear the colour is washing out quicker than expected. When you reapply, do make sure to follow the root regrowth application to avoid over-colouring your mid-lengths/ends. If you'd like to discuss this issue in more detail, please give our Advisory team a call on 0800 328 9214 and an advisor will be happy to help. Just dyed my dark blond hair with Pure Purple and then Shocking pink over the top and it has turned outo magenta! I love it! And best of all my hair is now soft, shiny and healthy looking. Thank you Live Colour I will be using your products for a long time to come! Response from Schwarzkopf LIVE: Hey Kat, wonderful to hear you're loving your colours! My experience with LIVE colours are just the best after a bad relationship I changed everything being a natural blonde!!! I decided to go for something Tottally different after much decision I chose pure purple LIVE colour!! 1. I like to be different from everyone else, I hate being the same. Response from Schwarzkopf LIVE: Great to hear from you Louise. To improve colour longevity we would recommend using shampoos/conditioners specially designed to be used on coloured hair. 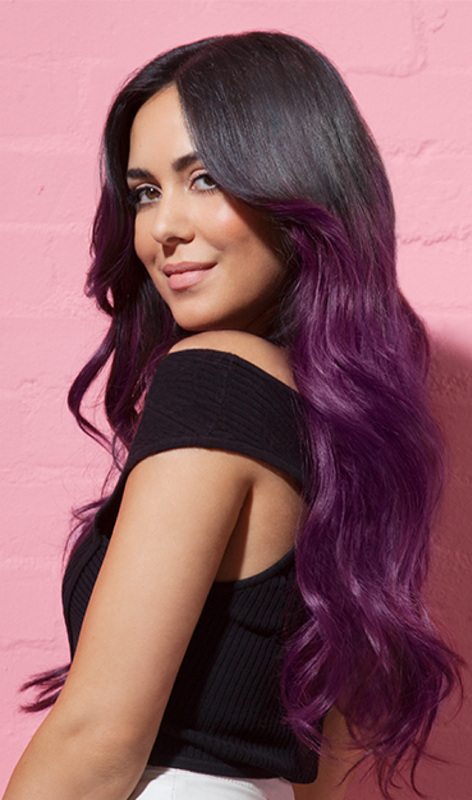 You can also refresh your colour in-between permanent application using our LIVE Ultra Brights Purple Punk shade, this'll keep you're locks looking even more vibrant. Happy colouring!